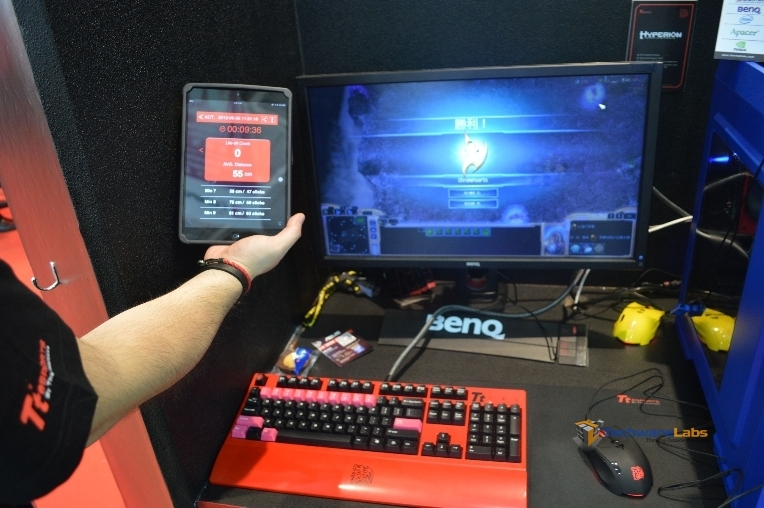 During Computex 2013, Thermaltake gave us at Techwarelabs a sneak peek into what they have planned for the future of Tt eSPORTS: A monitoring device embedded into their latest Theron mouse. This option when purchasing the mouse (Theron or Theron+) will allow the user to monitor APM, number of lifts, total distance traveled (as well as other planned metrics) during a gaming session. Since this is a hardware implementation the monitoring “app” is compatible with any game. While we were only able to see the beta for this “next level gaming”, the accuracy and desire is definitely there. The app (dubbed Tt eSPORTS+) works by connecting to the mouse via bluetooth (or to your desktop via the existent USB cable) to receive real-time data and archive it for later reference. Tt eSPORTS also plans to allow the app to integrate directly with Facebook and Twitter for live posting and comparison. The app is compatible with IOS, Android, and Windows based platforms.